Seems the poodles have gotten into the spirit of things around here and decided to help mom with her work at making the farm a dream home. They’ve been spending their days in the casita, in the grooming room and laundry, most days lately when we go to work. 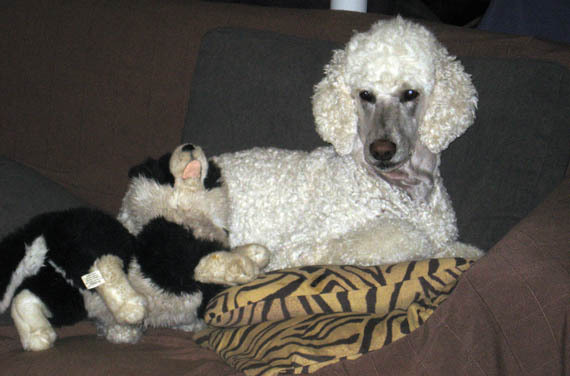 You try coming home tired and finding poodles covered in mud to their eyebrows two nights in a row. Since we moved to the farm they’ve generally had it really easy. They get the run of the yard while we’re at work most of the year. Its only this time of year (the wettest time), and on the odd very wet day during other times, that they get locked up during the day. I give them some ‘special left alone time’ toys, close the door and go to work, secure in the knowledge that they’re safe and comfy, dry and not muddy while I slave away at work. Today I got home to find they’d done some redecorating while I was at work. I guess its only to be expected. They were raised around rennovations, building, power tools and revolving furniture. It comes naturally to them. Today, they decided to put a new door (window?) in the toilet in the casita. We need a toilet with a view. Or maybe they were trying to dig their way to freedom. Well, I’m not upset. That toilet is disgusting. Those walls are so damp Marie Curie would feel at home in there. Anyway, I’m really looking forward to this weekend. I really want to do some work in the casita – mainly in the laundry area and grooming room. Some re-arranging. Some tidying up. Making the spaces more practical and user friendly. And to confuse DJ next time he goes in there. He really hates it when I move furniture. Maybe I can get the poodles do more demolition work for me? hmmm?